Thomas H. Arbuckle was born in 1875 at Ohio; info from 1880 Ohio Census. He was the son of Elisha H. Arbuckle and Jennie K. Cummings. [S1111] B. Esther (Oviedo) Harn, "E.B. Harn Sheets, FHL film 1036595, # 151", Feb 1977 (18921 Knapp St., Northridge, CA 91324). Hereinafter cited as "E.B. Harn Sheets, FHL film 1036595." Samuel Arbuckle was born in 1880 at Ohio; info from 1880 Ohio Census. He was the son of Elisha H. Arbuckle and Jennie K. Cummings. 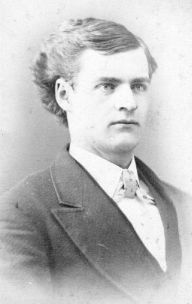 Ward Arbuckle was the son of Elisha H. Arbuckle and Jennie K. Cummings. Evan Fletcher was the son of James M. Fletcher and Anne Arbuckle. [S277] B. Esther (Oviedo) Harn, "E.B. Harn Sheets, FHL film 1036595, # 148", Feb 1977 (18921 Knapp St., Northridge, CA 9132433). Hereinafter cited as "E.B. Harn Sheets, FHL film 1036595." Webster Fletcher was the son of James M. Fletcher and Anne Arbuckle. Alice Fletcher was the daughter of James M. Fletcher and Anne Arbuckle. Raleigh Russell was the son of Samuel C. Russell and Emma Arbuckle. [S1112] B. Esther (Oviedo) Harn, "E.B. Harn Sheets, FHL film 1036595, # 150", Feb 1977 (18921 Knapp St., Northridge, CA 91324). Hereinafter cited as "E.B. Harn Sheets, FHL film 1036595." Letha Russell was the daughter of Samuel C. Russell and Emma Arbuckle. Ledocia Lenox was the daughter of Nelson Lenox and Jane Arbuckle. [S1113] B. Esther (Oviedo) Harn, "E.B. Harn Sheets, FHL film 1036595, # 149", Feb 1977 (18921 Knapp St., Northridge, CA 91324). Hereinafter cited as "E.B. Harn Sheets, FHL film 1036595." Lethe Lenox was the daughter of Nelson Lenox and Jane Arbuckle. Wallace Lenox was the son of Nelson Lenox and Jane Arbuckle. John Lenox was the son of Nelson Lenox and Jane Arbuckle. [S1114] B. Esther (Oviedo) Harn, "E.B. Harn Sheets, FHL film 1036595, # 167", Feb 1977 (18921 Knapp St., Northridge, CA 91324). Hereinafter cited as "E.B. Harn Sheets, FHL film 1036595." [S1615] William B. Stewart J. Adger and Hollingsworth, The Hollingsworth Family : Descendants of Valentine Hollingsworth, Sr (Louisville, KY: J.P. Morton, 1925). Hereinafter cited as The Hollingsworth Family : Descendants of Valentine Hollingsworth, Sr.
[S1984] Nora May Hollingsworth, death 50596 (22 Aug 1952), unknown repository, unknown repository address. Hereinafter cited as Death Cert: Nora Mae Hollingsworth. Florence Coney Hollingsworth was born circa June 1890 at Ohio.2 She was the daughter of Thomas Elwood Hollingsworth Sr. and Elanora Coney. Florence Coney Hollingsworth married Harry G. Smith.1 Florence Coney Hollingsworth died after 1918. Thomas Elwood Hollingsworth Jr. was born on 5 May 1892 at Ohio.1,2 He was the son of Thomas Elwood Hollingsworth Sr. and Elanora Coney. Following from The New York Times; Aug 1, 1917; ProQuest Historical Newspapers The New York Times pg. 1. Thomas E. Hollingsworth, who lives at 404 Eight Avenue, Brooklyn, is the first New Yorker to join the National Army of the United States. Mr. Hollingsworth appeared before Board 145 at the City College last night. He passed the physical examination with flying colors, and as he came out of the examining room quietly remarked to the members of the board: "Sign me up. I do not claim exemption." And then Mr. Hollingsworth without waiting to receive the congratulations of the members of the board, of which Dr. Charles H. Tuttle of the City College Faculty is the Chairman, walked out of the building and started for his home in Brooklyn. William Newell was born circa 1850 at Indiana; info from 1870 Minnesota Census. He was the son of Robert Newell and Rachel Charlotte Harn. William Newell lived at Shakopee, Scott Co., Minnesota. [S1115] B. Esther (Oviedo) Harn, "E.B. Harn Sheets, FHL film 1036595, # 141", Feb 1977 (18921 Knapp St., Northridge, CA 91324). Hereinafter cited as "E.B. Harn Sheets, FHL film 1036595." Frank Newell was the son of Robert Newell and Rachel Charlotte Harn. Schuyler Newell was the son of Robert Newell and Rachel Charlotte Harn. John Newell was the son of Robert Newell and Rachel Charlotte Harn. Letha Zelma Harn was the daughter of John Henry Harn and Clemintine Long. [S966] B. Esther (Oviedo) Harn, "E.B. Harn Sheets, FHL film 1036595, # 137", Feb 1977 (18921 Knapp St., Northridge, CA 91324). Hereinafter cited as "E.B. Harn Sheets, FHL film 1036595." Benton Harn was the son of John Henry Harn and Clemintine Long. Emma R. Stevens was the daughter of John R. Stevens and Joanna Margaret Harn. [S1116] B. Esther (Oviedo) Harn, "E.B. Harn Sheets, FHL film 1036595, # 136", Feb 1977 (18921 Knapp St., Northridge, CA 91324). Hereinafter cited as "E.B. Harn Sheets, FHL film 1036595." Georgia Stevens was the daughter of John R. Stevens and Joanna Margaret Harn. Nattie Harn was the daughter of Wesley Jaleel Harn and Urith Mannahan. Nattie Harn married Jacob Ecker. Her married name was Ecker. Census August 1870 Liberty, Frederick Co., Maryland, Nettie W. listed as 9 years old and born in Maryland. [S1117] B. Esther (Oviedo) Harn, "E.B. Harn Sheets, FHL film 1036595, # 134", Feb 1977 (18921 Knapp St., Northridge, CA 91324). Hereinafter cited as "E.B. Harn Sheets, FHL film 1036595." Calvin W. Harn was born in October 1858 at Maryland.2 He was the son of Wesley Jaleel Harn and Urith Mannahan. Calvin W. Harn married Sallie A. Doyle in 1889. Calvin W. Harn died before April 1910. Census August 1870 Liberty, Frederick Co., Maryland, listed as 10 years old and born in Maryland. Source Citation: Year: 1900; Census Place: Baltimore Ward 23, Baltimore City (Independent City), Maryland; Roll: 618; Page: 6B; Enumeration District: 0301; FHL microfilm: 1240618. Ancestry.com. 1900 United States Federal Censusdatabase on-line. Provo, UT, USA: Ancestry.com Operations Inc, 2004. Source Citation: Year: 1880; Census Place: Linganore, Frederick, Maryland; Roll: 510; Family History Film: 1254510; Page: 527B; Enumeration District: 092; Image: 0663. Ancestry.com and The Church of Jesus Christ of Latter-day Saints. 1880 United States Federal Census database on-line. Provo, UT, USA: Ancestry.com Operations Inc, 2010. 1880 U.S. Census Index provided by The Church of Jesus Christ of Latter-day Saints © Copyright 1999 Intellectual Reserve, Inc. All rights reserved. All use is subject to the limited use license and other terms and conditions applicable to this site. Ancestry.com. 1900 United States Federal Census database on-line. Provo, UT, USA: Ancestry.com Operations Inc, 2004. Census August 1870 Liberty, Frederick Co., Maryland, listed as 4 years old and born in Maryland. Ambrose E. Harn was born circa 1863 at Maryland; according to 1880 MD Census. He was the son of Wesley Jaleel Harn and Urith Mannahan. Ambrose E. Harn married Fannie (?) Ambrose E. Harn died on 26 February 1899 at Unionville, Frederick Co., Maryland. He was buried at Linganore Cemetery, Unionville, Frederick Co., Maryland. Census August 1870 Liberty, Frederick Co., Maryland, Ambrose E. listed as 7 years old and born in Maryland. Willie E. Harn was born circa 1868 at Maryland; according to 1870 MD Census. He was the son of Wesley Jaleel Harn and Urith Mannahan. Census August 1870 Liberty, Frederick Co., Maryland, listed as 2 years old and born in Maryland.